With President Monson passing away this week, I thought it would be appropriate to do a special singing time dedicated to him. I will still quickly sing Here We Are Together to welcome the new Sunbeams (in Jr. primary) and the new Jr. primary kids (in Sr. primary) and all the new teachers. See how I do that HERE. I'll just omit all the name tags so we can quickly welcome everyone. I will probably forgo my Article of Faith songs (see what those are HERE) at the beginning of singing time as well and just do those the next few weeks. I liked this idea HERE that Renae posted on the Chorister's FB Page HERE. It is simple to implement and a way to sing LOTS of songs all while centered around President Monson. I just created some visuals and added songs that related to the quotes to go along with the lesson plan (I did omit a few quotes because they were redundant and there is no way we'll get through all 13 of these!). Find them all HERE. I created documents without the suggested songs to sing in case you want to sing something else. Find those HERE. Then I've also got a version without the quotes HERE - mostly so those who need a translated version can just hand-write it in. If you want to make your own as a Word document or something similar, I downloaded the pictures from LDS.org HERE. MORE UPDATES: A request was made for more current quotes. I updated about half the quotes using the same song suggestions. You can find that update HERE. If you want more quotes, find a great article HERE. 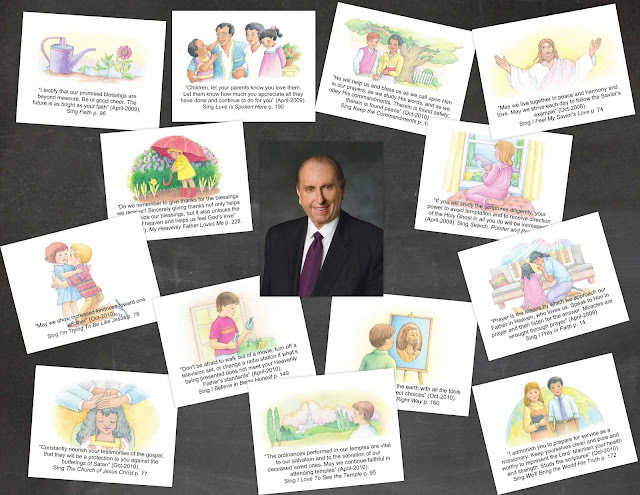 I used the photo of President Monson from my collection of pictures of the First Presidency and Quorum of the Twelve apostles but you can simply download and print a picture HERE. For the activity, I'll place the picture of President Monson on the chalkboard and we'll talk about how he passed away this week. Then I'll post his various quotes one at a time that relate to primary songs and we'll sing the songs, posting the words as needed. Tina, in the comments suggested listening to his final General Conference talk at the end. Great idea! This is such a great idea! I teach primary in French, and am wondering if you would be willing to share the quote and song sheets in an editable version so I can translate it and print it off in French? Thank you for sharing! Thank you Camille. This is great and so special to share with the children. I always love your ideas. I loved this idea, Camille! Any chance of having them in Portuguese too? I could give you the words. You are the best! Thanks SO much for all your work you do for others! Me encantó alguna posibiliodad de tenerlo en español, por favor? I'm getting slammed with custom requests and I'm just having to tell everyone I can't - I'm so sorry. I might have a nervous breakdown if I try to do it all. I'm trying to work on some sort of arrangement so I can customize document requests without losing my sanity but it won't be this weekend so I apologize. I may try to just add a completely blank document so you can hand-write in the quotes in the language you need for the time being. I created these in software that doesn't share well except as PDF and JPEG unless you have the same program as I do. I've updated the post so hopefully you can just hand-write in your own for now. Sorry I'm not more help! Also, reference my comment above. I love this! Thanks so much!! How did you find the pictures? I want to add a couple different ones but don't know how to get other pictures from the Children's Songbook. Also, for those that are trying to do it in other languages, if you download the file it'll save in a format that you can copy and paste the pictures into word or pages and add the text yourselves. Or just print the ones without text and write it in by hand. Never mind, I found the pictures!!! Camille, that is perfect! Thank you so much for sharing all the work you do. I really appreciate it. Camille, I'm so very greatfull for your faith. Thank you for all you do. Why are you so good to us. You make being a Primary Chorister so much easier. Thank you! I did it today too and had the kids listen to part of the last of President Monson's last talk. It was very powerful and we had a very spiritual singing time reading the quotes and singing the songs. Thanks again! Great idea with listening to his last talk! It was a great one! I think I'll add that to the post! You are a Primary Treasure! I utilized your tribute to Pres. Monson with our Sr. Primary, today. It was phenomenal. I cried during half the songs and the children were reverent and singing with their all hearts. Heartfelt thanks for helping me be a better chorister and live more like Monson. Thank you So much for sharing this. We had a wonderful singing time as we read the quotes and experiences/testimonies of their application in our lives. thank you so much for you idea. When well in my primary here is Colorado.